I have just reacquainted myself with six dear old friends. As I mentioned in my FanLit minibio (below), back in high school, this reader just could not get enough of the adventures of Doc Savage and his five faithful associates, eagerly devouring four dozen of the Doc Savage paperbacks that Bantam books released in the late ‘60s and early ‘70s. These paperbacks were hugely popular back in the day and are now highly prized collectible items, not only for the stories themselves, but for the beautifully rendered cover illustrations that James Bama created for well over 100 of them. Eventually, though, I tired of reading the Doc Savage novels, as a certain formulaic sameness started to become evident in them (and indeed, years later, I learned that author Lester Dent did have a chart hanging on his office wall, delineating what was to happen by certain points in every book), and after gobbling down those 48 novels, left around seven of them unread. And they stayed unread for a very long time … until just last week, actually, when I picked up and devoured my first Doc Savage novel since high school … and high school, for me, was a very loooong time ago! It has just struck me that there might be some of you who have not had the pleasure of encountering Doc & Co., so allow me to give you a very brief history of this seminal pulp character before I proceed. Doc Savage was an almost superhuman, bronze-skinned genius who was trained from a very young age, by his father and a group of leading scientists, to be both a mental and physical wonder. As a scientist himself, he excelled in dozens of fields, primarily medicine and surgery, and his fantastic inventions and gifts to mankind were legion. Provided with a nearly unlimited supply of gold, courtesy of some benevolent lost Mayans in a Central American valley, Doc Savage utilized his physical, mental and monetary gifts to combat crime whenever and wherever he could. And he was aided by five very unusual characters: Lt. Col. Andrew Blodgett Mayfair, aka Monk, a 260-lb. tank of a man who was also one of the world’s foremost chemists; Brigadier General Theodore Marley Brooks, aka Ham, a brilliant and always dapper lawyer who was never seen without his trusty sword cane; Col. John Renwick, aka Renny, one of the world’s greatest civil engineers, whose fists were of an enormous size; Major Thomas J. Roberts, aka Long Tom, the slender weakling of the group (comparatively speaking) but also one of the world’s foremost experts in electricity; and finally, William Harper Littlejohn, aka Johnny, one of the world’s foremost geologists and archaeologists. From the first issue of Doc Savage Magazine (March 1933 … the same month that King Kong had its premiere, incidentally) and over the course of 181 issues, ending with the Summer ’49 edition, the publication thrilled, amazed and entertained Depression, wartime and postwar readers with a monthly dose of remarkable pulp adventures. And of those 181 issues, Lester Dent, writing under the house name of Kenneth Robeson, was responsible for writing (or, in some cases, co-writing) no fewer than 155! A truly remarkable feat, and if you think it a simple matter to think up and write a 150-page novel — even a pulp novel — month after month, year after year, to the tune of 155 finished works, I invite you to try it sometime! To continue: Over the years, there has been much speculation as to whether or not Doc Savage was an inspiration for the Superman character, which first appeared in 1939. For me, however, there has never been a shred of doubt regarding this matter. Consider this: Doc Savage was known as The Man of Bronze, his real name was Clark Savage, Jr., and he had a retreat in the Arctic known as his Fortress of Solitude, to which he would repair by himself to work on his gifts to mankind. Superman was known as The Man of Steel, his real name was Clark Kent, and he had a retreat in the Arctic known as his Fortress of Solitude. (And oh … Doc is referred to as a “superman” in the novel I just finished!) I rest my case. But as to the book I just read: It was the Bantam paperback #68, Quest of the Spider. 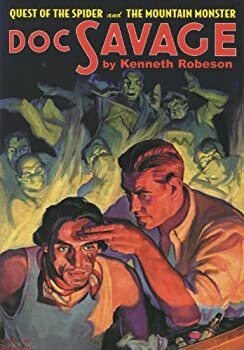 This, as it turns out, was a very suitable book to help reacquaint myself with these famous characters, as Quest of the Spider, which first appeared in the May ’33 issue of Doc Savage Magazine, was the third novel in the series, out of those 181. (The order of the Bantam paperbacks and the order of the magazine releases have very few similarities, it would appear.) In this installment, a mysterious figure known only as the Gray Spider sets his sights on taking over all the lumber industries in the southern U.S. Owners of all the major lumber concerns have been disappearing completely, or are suddenly signing over all their assets to puppets of the Gray Spider. But when “Big Eric” Danielsen, owner of the South’s largest lumber company, is attacked and subsequently coerced to sell, he takes his beautiful blonde daughter Edna to NYC to confer with his old college buddy, Theodore Marley Brooks, and try to enlist his and Doc Savage’s assistance. In true pulp fashion, Quest of the Spider dishes out fast-moving action set pieces in every single one of its 17 chapters. Indeed, in the very first chapter, the Danielsens are compelled to make a quick exit from their NYC-bound passenger plane, in which a Gray Spider minion has just exploded a bomb in the washroom … an airplane with two parachutes too few, as it turns out! Other standout action bits include that poison gas attack in Big Eric’s office, forcing Doc & Co. to take refuge on a very narrow, very high, outdoor window ledge; Johnny’s infiltration of the swamp snipes’ hideout, disguised as a voodoo priest; Doc’s apparent demise after doing battle underwater with a bayou gator; the penultimate showdown in those swamplands, with Doc and his men besieged by dozens of the Gray Spider’s underlings; and the final showdown at the Gray Spider’s hidden Castle of the Moccasin, replete with blasting hand grenades, poisonous flies, and the ultimate revelation of the chief villain’s actual identity. As to that last bit, the Gray Spider wears a gaudily colored silk handkerchief over his face throughout the novel, and his secret identity is meant to be something of a mystery by Dent. But since there are only two possible suspects to choose from in the book, guessing the Gray Spider’s actual identity is something of a snap for the reader. This old fan was not at all surprised at how things turned out, in this regard. Interestingly, Monk, Renny, Long Tom and Johnny do not make an entry into this book until almost the halfway point, but their first appearance is an explosive one. And in this third Doc Savage adventure, the reader learns what The Man of Bronze does with all the villains whom he captures (those who don’t perish while resisting him, that is). Curiously enough, there are not turned over to the cops for trial and imprisonment, but rather, are sent to a facility in upstate NY that Doc maintains, where their memories are wiped clean and they are taught the rudiments of becoming solid and productive citizens. Surely, some food for debate vis-à-vis ethics and penology there! These are all things that didn’t bother me much back in high school, but that tend to irk me a bit more today, now that I am supposedly a reasonably enlightened, adult copy editor and proofreader. I suppose that the Doc Savage novels grew a bit more polished as Dent practiced, practiced and practiced his craft, also. Still, even in this early and imperfect outing, the sheer propulsive drive of the action itself, and the book’s colorful backdrop and unique story line — not to mention those six wonderful lead characters, who are all so easy to fall in love with — manage to make this another terrific bit of Doc Savage escapism. These books are like bonbons, and I personally cannot wait to try my next one. Incidentally, I hear that no less a figure than Dwayne “The Rock” Johnson has just been tapped to star in an upcoming Doc Savage movie, and I cannot imagine a more appropriate casting choice. Can’t wait! I learn so much from your reviews, Sandy!! I don’t know if you ever saw the cult movie “Buckaroo Bonzai” but reading this review I wonder if Buckaroo’s collection of sidekicks (Including Jeff Goldblum)– and Buckaroo himself, were based on Doc Savage, Man of Bronze. I’ve been meaning to see that film for many years, Marion, and still have not done so. I sure do hope to catch up with this one soon….